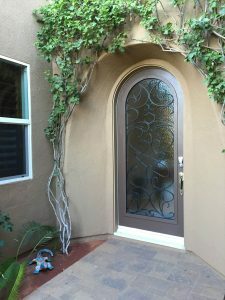 Getting a front door can change the aesthetics of your house quite a bit, as your front door is one of the first parts of your home that guests will see. Furthermore, front doors are visible from the street and can have a serious effect on increasing your home’s curb appeal. So, if you’ve been thinking about getting a new front door because you want a change in the look of your home, or simply want a glass door to let in more light, but worried about the process taking too long, don’t stress. Your Door Our Glass has changed the way in which front door installation is completed, making it an easier process than you may think, all within a short period of time. Our expert services have been serving the Riverside California and surrounding areas, so let us help you get your home looking beautiful! Let’s explore the ease of getting a new door with Your Door Our Glass. With Your Door Our Glass, you can give your existing door a makeover to enhance the quality and improve the looks of your home. One of the upsides of this is the money saved from using the same door. Remodeling an existing front door costs about fifty percent less than replacing a door, providing you with incredible savings, and a fresh, new looking door. That’s a lot of savings, and gives you the peace of mind knowing that your door will for sure fit within the door frame. Worried that colors may be mismatched between your door frame and your new, upgraded door? Don’t stress. We paint the frame around your glass to match your door, both inside and outside. If you painted your door recently, but can’t seem to find the paint can lying around in the garage or basement, we take care of it as a complimentary service. We want you to be proud of your new glass door, and believe that our expert services can provide that. Worried about a long, drawn out process? With us, you can pop in your favorite movie, and sit back and relax while we get the job done. It will not take longer than a few hours to have your door transformed into a beautiful, decorative glass door. Wondering what glass you should use? Worried about visibility into your home? We have the answers to all of those questions, as we have a variety of products to choose from, like iron with glass, custom glass, premium or designer choice door glass. 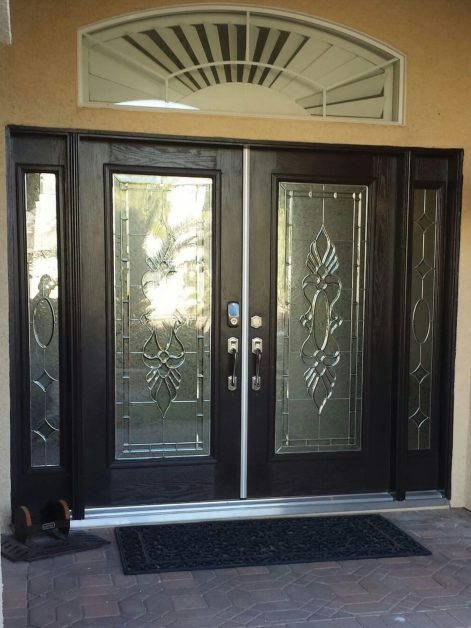 Your Door Our Glass makes it easy for you to transform your existing front door with beautiful and decorative glass. This allows for more natural light, higher curb appeal and a happy you when you come home to your new door. So, if you’re worried about the process — don’t stress. The ease of getting a glass door with us provides you with quick installation and incredible results. Check out our website to learn more about us, or contact us today to transform your door!